As we’ve said on this blog before, the great thing about business process automation is that it can perform the same tasks that a human operator can. You need to log into a web application and pull data? Your BPA software can do that. You need to query a database, create an Excel report and send it to your boss? A software robot can handle that, too. This means that a robust business process automation platform can handle almost any repeated process. Unfortunately, sometimes the processes that human operators are performing are not that efficient. These inefficiencies can carry over into the automated process if you’re not careful. For example, maybe you are generating multiple reports that could be consolidated when you automate. Or maybe you have built in a step to double-check for accuracy—necessary when error-prone humans are doing the task, but maybe not when your automation solution manages it. Implementing a new automation platform is the perfect opportunity to optimize and potentially rework your business processes. Which Processes Should You Automate? Most organizations have a long list of processes that could potentially be automated. To determine which will give you the best ROI, think about which tasks are taking up the most time for your team. Is any staff member spending more than 30-60 minutes on a certain process every day? If the process is repeatable and follows a set of rules, it can probably be automated. While business process automation has the capability to take on some very unique processes, there are a few that are especially common time-wasters in business, including managing file transfers, manually entering data into multiple systems, provisioning new employees in Active Directory and other applications, managing email requests, or navigating websites to download files or extract data. Would you like business process automation software to take any of these processes off your plate? Now that you have determined a process to streamline, the first step is to make sure you are aware of exactly how the process currently works. Don’t worry about business process optimization yet—just make a list of every step in the process. There are a few critical factors to note. First, it’s essential to know what the trigger is for this process. What causes the process to start—an email or file arriving? The end of the month approaching? Secondly, what is the expected result of this process? Does the process have any output, such as a report or an outbound email, and where does the output go? Once you’ve established the beginning and the end of the process, fill in each of the steps in between. Make sure you can link each step. If the arrival of an email attachment leads to extracting the data from the attachment, how does that email get from the inbox to the person or program doing the extracting? Accurately documenting the process may involve talking to several people or groups within your organization. Sometimes one group might not have any idea how the other group is completing their portion of the workflow. Are you ready see how Automate can help? Once you’ve accurately documented the entire process from start to finish, it’s time to start optimizing your process. The most important question here is: Why? What is the purpose of each step in the process? Unfortunately, often the answer is simply that the task has always been done that way. The teams involved with the process may be resistant to the idea that their process isn’t being done effectively, or they may just not want to make the effort to change it. Many people are excited about the idea of saving time through automation, but don’t realize that some process improvement is necessary to maximize the hours they will save. If you are the one responsible for rolling out your new automation strategy, make sure you don’t waste your time automating inefficient processes that will need to be reworked later. When a process is automated efficiently, it has big benefits for the whole company. See how this company saved 20 hours every week just by automating their weekly and monthly reporting, or how this health care provider saved 50 hours per week automating file transfers and other processes. Think about the process output that you outlined in the documentation stage. Any step that is not essential to achieving that output should be eliminated. For example, if you are entering information into multiple systems, are they all necessary? Are you printing paper copies of documents for no good reason? This is the perfect time to get rid of unnecessary steps. You might want to consider rolling out your automated process in stages. For example, your original process might involve a file arriving in an inbox, the file being manually saved to a specified folder by one employee, and then a second employee manipulating the file through time-consuming copying, pasting, and re-saving. Automating the file manipulation tasks will streamline the most painful part of the process and give you a great ROI right out of the gate with your new automation tool. Later, you can also automate monitoring the inbox and saving the file to the folder, totally eliminating the need for human intervention. This is the fun part! You have a streamlined list of steps, each of which are essential to achieving a business objective. With user-friendly business process automation software, you can easily drag and drop it all into place—no scripts needed. Here’s an example of a streamlined HR onboarding process. The original process involved multiple employees performing over three hours of combined work. 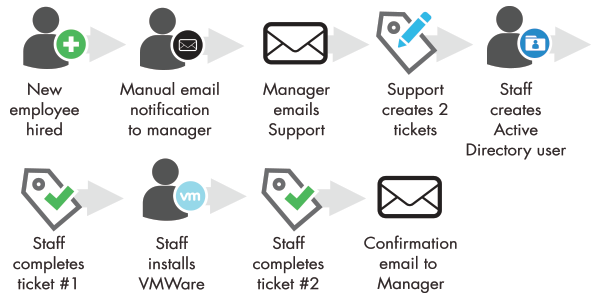 The streamlined process not only eliminated the manual work, but combined the support tickets and consolidated the number of emails being sent. Are you ready to start optimizing your unique business processes? Start a free 30-day trial of Automate and see business process automation in action.